Unique use of heat pumps for reverse extraction of heat by connection to process at a state-of-the-art research facility. The water-water MasterTherm heat pumps have a total installed heating/cooling power capacity of 850 kW/680 kW will cool individual research devices and the recovered heat will be used for year-round domestic hot water heating and heating. The thermal heat pumps will be also used for efficient absorbing of surplus energy in combination with a system of dry coolers located on the roof. The solution includes production of cooling water for the air-conditioning system and under favourable conditions free cooling of the technology. 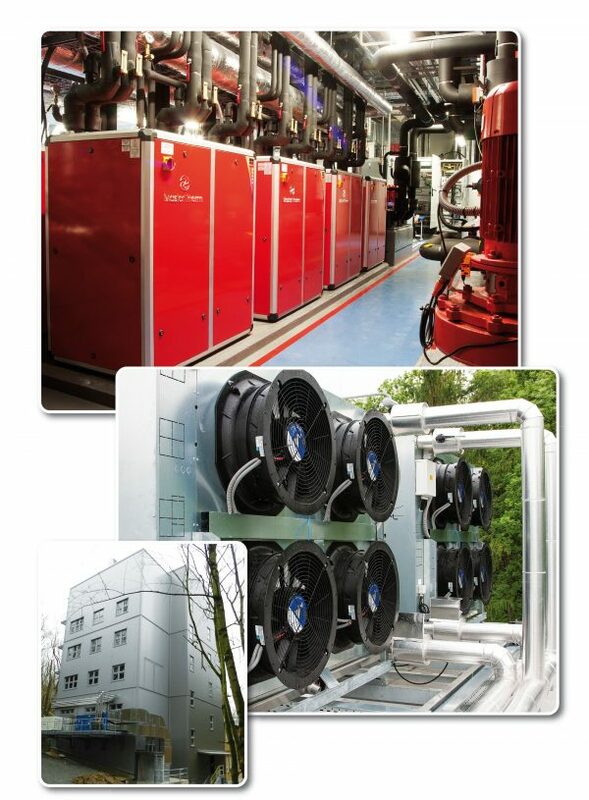 During the heating season, when there is a lack of technological heat, the building can be heated using the system of water-water heat pumps and glycol circuit by acquiring thermal energy from the surrounding air (air-water). The system is able to operate in this mode by sub-coolers (i.e. additional coolers of liquid coolants), which utilize the unused heat of the cooling circuit for defrosting the dry coolers without any increase of total energy consumption. It is a remarkable solution and innovative installation of water-water thermal pumps which combines reverse extraction of heat, top-notch technological cooling and heating of the building in the air-water mode, uniquely without any defrosting energy demands.